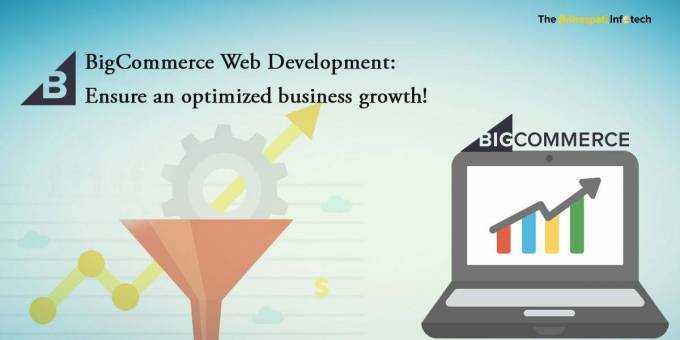 BigCommerce Web Development: Ensure an optimized business growth! Today’s online retail industry holds many remunerative opportunities and a huge level of competition simultaneously. With many merchants opting for selling online, it has become hard for startups or low scale businesses to survive. In contemplation of achieving success, they tend to look for superior and cost-effective eCommerce solutions that can provide them with an appropriate business foundation. Among many other platforms available in the market, BigCommerce is becoming an often chosen option to set up and scale online web stores. However, there are many business owners who are still struggling to figure out the best eCommerce platform to ensure an optimized business growth. Therefore, I have curated this piece of writing to throw light on some powerful features of BigCommerce that can help you decide wisely. BigCommerce does most of the work for you and saves cost while you can focus on your other business aspects. It is a hosted eCommerce solution that cuts down your time and tens of thousands of dollars every year to manage servers and teams. Being a hosted eCommerce platform, BigCommerce is quite secure and doesn’t require a high level of technical expertise as compared to self-hosting. Industry-leading uptime of 99.99%, fast-loading & higher-conversions, multi-layered security, Sitewide HTTPS boosts conversion, DDOS protection for Enterprise plan, and Level 1 PCI-compliant hosting are some of its wonderful features to consider while planning to set up online. With the introduction of powerful theming engine i.e. Stencil, BigCommerce has surpassed many of its competitors. Stencil is quite distinctive and it comes with a whole new approach to front-end and theme development on BigCommerce web platform. Stencil theme is primarily reinforced on open-source & non-proprietary code to play down the learning curve for BigCommerce developers. With this, you can iterate themes locally and perform BigCommerce theme customizations without even interrupting your live store’s functioning for the audience. Built on latest best practices in design standards, Stencil Theme Framework provides you with multiple theme variations for merchants, customize theme’s default look without writing a single line of code, and a ready-to-use theme editor. In order to increase your website’s performance and productivity, you always need integrations of some powerful apps. From marketing and conversion apps to shipping apps to enhance order fulfillment, you need to adopt apps integration. And, BigCommerce holds the best selection of business apps and their integrations in context with supporting eCommerce activities. It offers you a wide array of apps that can help you to manage your business more efficiently in a long run. Being an online retailer, you tend to grow and shift your business goals periodically towards a determined goal. So, you will always need to keep growing and expanding in regards to your eCommerce platform as well. And, when you opt for PSD to BigCommerce conversion, you are bound to ensure a scalable foundation with its APIs. With its open APIs, it helps you to develop and scale faster than any other platform. Its open APIs and webhooks are always appreciated by developers as these can be effectively used to develop elegant web solutions quickly to address complex issues. Every BigCommerce web development is supported by seamless pre-built integrations, out-of-the-box capabilities, for instance, its faceted search & ShipperHQ integration to streamline online business and get rid of multiple systems working parallel. BigCommerce web development is always accompanied by phenomenal customer service to make the complete process incredibly smooth. No other leading eCommerce platform offers you in-house and on-boarding teams who are available to launch your website with a complete ease. It also offers you a 24/7 chat, Phone support (US-based), email support for resolving technical issues along with a premium team that helps you grow. BigCommerce is a powerful eCommerce platform that is currently powering many successful giants in the market like Toyota, Travelpro, Kodak etc. Built on a SaaS platform, it provides you with a seamless business scalability at any level of your business. Be it SME or large enterprise brand, it has got offerings to serve all for a sustained growth.